There is no more tragic story from the early days of cycling than the legendary Vance (The Leggman) Leggstrong. 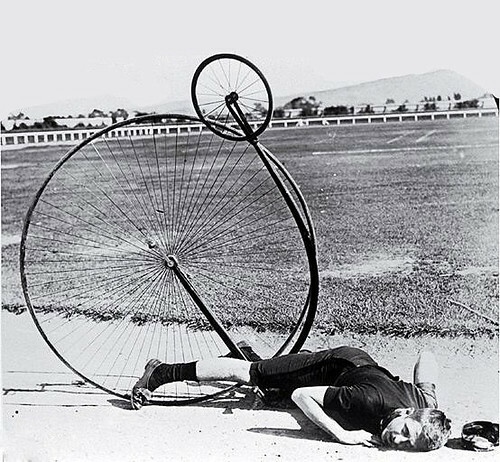 For nearly a decade, none could match his feats of strength, endurance and mind-bending willpower on the Penny Farthing Circuit. He won the famed Tour de France seven years in a row. (In the 1880s the race was constrained by the lack of paved roads, and included only the cobbled streets of Paris plus the one experimental paved road in the Bois du Boulogne) There was no more famous athlete in the Western world. Women loved him. Men wanted to be him. The bidding war for his endorsement contracts were so hard fought that it contributed to the depression of the early 1890s. He was on top of the world until it was discovered that his legendary willpower, which had allowed him to keep peddling over the cobblestone streets when most of the other cyclists had long since fallen off their ridiculous bikes from a combination of motion sickness, tooth-rattle, and advanced gonad-shake, was enhanced by laudanum poppers. Of course he could take the punishment! He was constantly sucking on hard candies laced with heroin! He never admitted to doping, and years later he tried to make a comeback. Unfortunately, in the intervening time his addiction to laudanum poppers had morphed into a serious case of “chasing the dragon,” which was the opposite of performance enhancing. Got an itch for funny? Scratch it with some satirical fiction. Alltop likes to walk. velooooooo-vi, a photo by Foxtongue on Flickr. Next Post Silver IBPA Benjamin Franklin Award for The Fatness!